As a member of the family which controlled the Boston Globe,and as the newspaper’s treasurer from 1893 to 1937, Charles Henry Taylor avidly collected publication on the history of American printing and journalism. He generously donated to AAS anything it lacked. Among his gifts were runs of many important American newspapers, including this issue — the second earliest at AAS — of The New-England Courant. 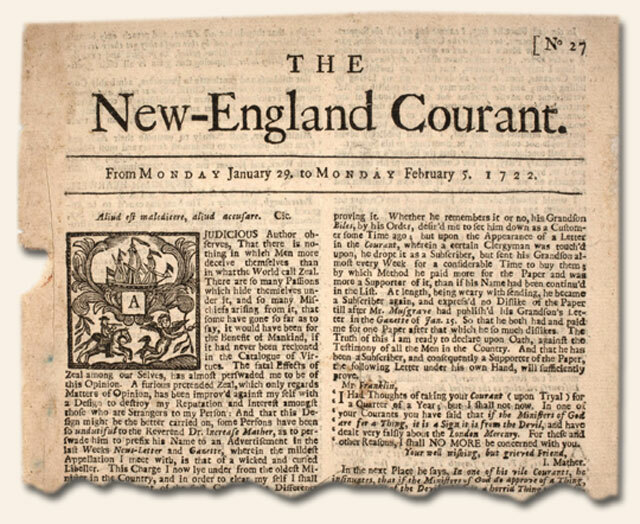 Only the third newspaper to be printed in Boston, The New-England Courant was published by James Franklin from 1721 to 1726. During the Courant’s first two years, its popularity was bolstered by the publication of fourteen letters from one “Silence Dogood,” the nom de plume of James’s younger brother and apprentice, Benjamin Franklin. But the Courant had a contentious history, as James was often at odds with the provincial government, the powerful Mather family, and other influential Bostonians. In 1723 James was imprisoned by the Massachusetts General Court and ordered to suspend the Courant, a ban which James circumvented by issuing the paper under his brother’s name. Even after Benjamin ran away to Philadelphia in October of that year, the Courant continued to appear under this imprint until it ceased publication. The front page of this issue contains an extensive article on the smallpox inoculation controversy then raging in Boston. While Cotton Mather and other clergy supported inoculation, many Bostonians disagreed. James Franklin opposed the practice in this and many subsequent articles. 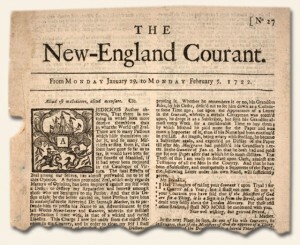 After James Franklin was suspended from publishing the New England Courant, publication of the Courant continued under the name or Benjamin Franklin, who had not been suspended. An interesting fact is that the name of the publisher in the Courant is spelled out in full as “Benjamin Franklin.” In later years when Ben Franklin had his own press in Philadelphia, his name was always abbreviated as “B. Franklin”. The only place you are likely to his name spelled out in full is on the New England Courant.